In the end it turned out alright, for something so rushed. A lot of the sizing was off – you can see where she had to grind down the corner of the chest piece because it was interfering with the pauldron. We should have spent more time patterning. Oh well. BE THERE ANY CRIMES HERE? I bought a heart rate sensor ($24), which you can see attached to her neck in the picture, and hooked it up to a flora ($23). There was also a small OLED display ($10), and a fan ($4), and I threw in a neopixel ($4) as well. The sensor gave me some trouble – its values were all over the place. Instead of figuring out what was going on, I put it through a ton of processing, including a few passes of exponential smoothing. Eventually I got the values within a range I could deal with. The end result is a heart rate sensor that, while not super accurate, flatlines immediately on disconnect. I modeled an partial enclosure for it, and printed it with my 3d printer. TinkerCAD is really cool. I like it a lot. Dayna added a badge number. The dark grey cylinder represents the size of the fan. Here it is complete. She wanted the electronics exposed to show her cyborg nature. The OLED displays a sine wave based on her heart rate. The fan turns on and off as well, staying off on flatline. Behind the fan is the neopixel, which pulses and changes colour according to the heart rate data. There were also the pauldrons. I embedded a magnet in one, and another in a 3D printed badge Dayna modeled. Magnetting them together was pretty satisfying. How embarrassing would it have been if I’d put one of the magnets in the wrong way. I think instagram is messing up the sounds. 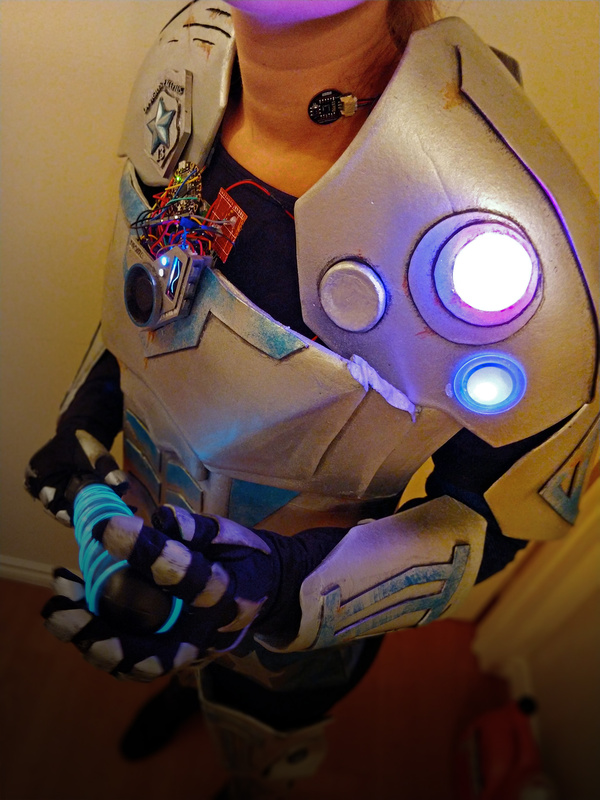 The other pauldron had more electronics in it. Whooo-oooh whooo-ooooh whooooo-oooh. Or however police sirens go. That button is covered by a piece of foam, and we put half a glow-in-the dark ping pong ball over the spinning police light to diffuse it a bit. Turns out ping pong balls are really easy to cut with exacto knives. It looks pretty cool in real life, but as you can see, I haven’t figured out how to get it to come across at all in photos. 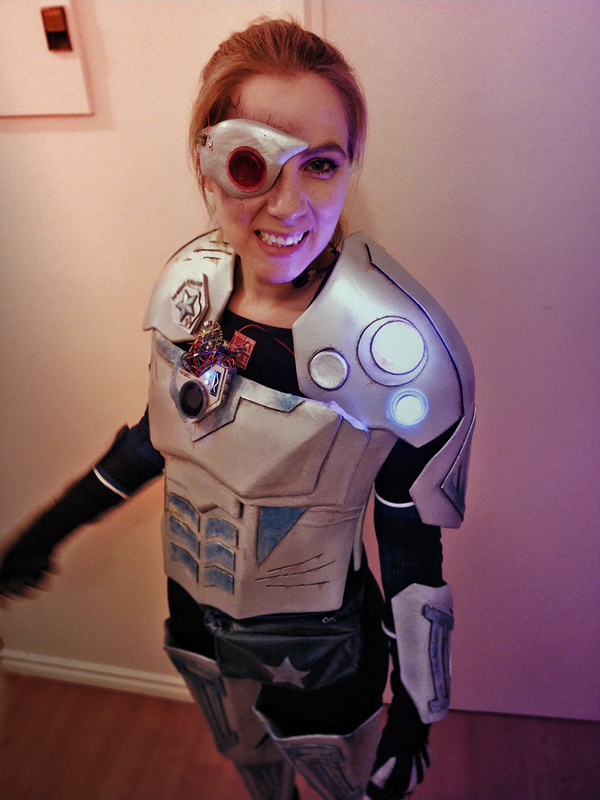 Cyborg police officer ready for policing.